If you missed Assignment #4, you can read it here. So, um, I had all these grand ambitions that I was going to get this post up before 7:30 p.m. EST tonight… and instead, I was running around like a chicken with my head cut off trying to get the last minute technical stuff taken care of for the webcast. But, it all got done in time, the webcast went well (despite some technical issues — thanks for your patience and for all of you who took time out of your busy evening to show up!) and I’m finally able to post my update on my home organization today. 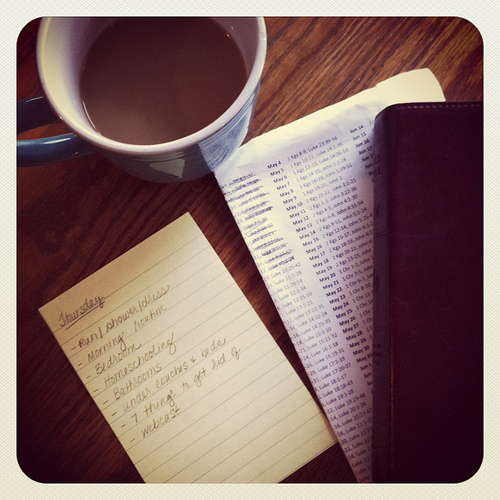 My day started out like usual with my early morning coffee, Bible reading, and to-do list writing. Then it was more homeschooling and just keeping up with everything and everyone here. I finally got to jump in the shower mid-afternoon. 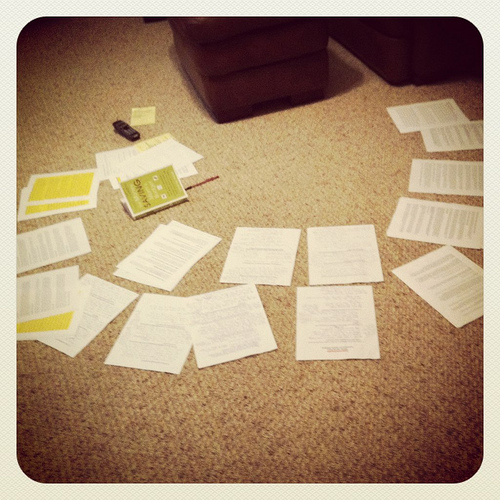 And then I tackled the home organization projects. And then I braved cleaning out underneath the couches. And here are the 7 items I came up with to get rid of today — including two earrings without matches. Don’t ask me why I’ve hung onto them. I guess I figured that maybe the matches would turn up or something? After six months, I say it’s high time I let ’em go. How did you do on Assignment #4? I’d love to have you share your progress and success with us so we can be inspired. Either post a link to your blog post below or leave a comment with your update. Looking for more? 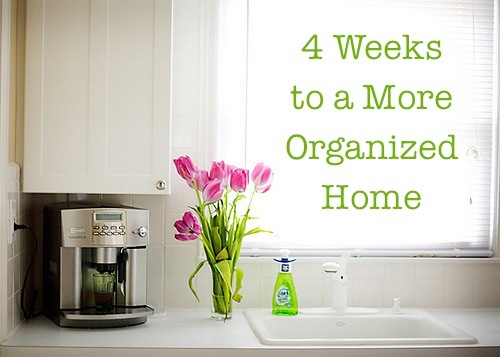 Read more posts about 4 Weeks to a More Organized Home. Got caught up in stuff so I didn’t even print up Assignment #4…. Amazing job! I am quite behind on the assignments and had high hopes of tackling quite a bit before work this morning. Unfortunately, my little one decided 4:30 am is a perfect wake up time and so my work time fizzled into entertaining the toddler time. I am working on my goals for Friday and hope to be on task by tomorrow evening. Thank you for this series as it is helping guide me through organizing and cleaning. You can always see underneath our living room couch so it was clean but the living room floor did get a vac and steam today (it’s wood). 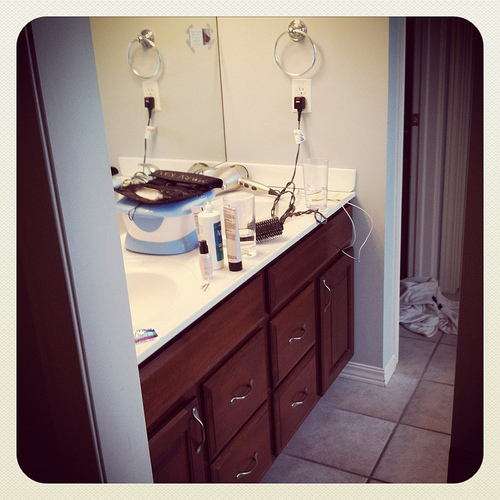 The bathroom, kitchen and my bedroom got a once over as well as the coat closet being cleaned out and decluttered. We got rid of 18 things, I was hoping for 21 so I would be caught up but didn’t quite make it. So for now I am behind on 2 things to get rid of. How can I get the assignment from 1-3? I have been trying to organize and would love to follow your tips!! I was wondering the same thing. Did you ever find out where assignments 1-3 can be found? I am really loving this challenge. I have been getting rid of seven things each day, and doing the 15 minute task for each day. I have a long, long way to go in getting my house clean and organized, but this is helping without feeling overwhelming. aww, don’t be horrified! We ALL from time to time get collections in our sofas, under them and other places we’d rather not think too much about (anybody else just think about under their oven or fridge?). Our sofas have pretty high feet and toys end up under them daily, so I have to clean it out daily….what did horrify me was without thinking of it, I posted a photo of the mountain my boys created with all of the sofa cushions while I was in the next room doing some of my home business stuff onto my business facebook page!! Without even thinking to check to see if there was anything on the bare furniture!! Man did I get lucky…and you never know, maybe someone *was* saving that carrot. -thank you for your honesty and not being afraid to share yourself with us. It’s the high point of my day. That is EXACTLY how I like my bathroom countertops to look! Visual clutter = mental clutter. Well, I will make YOU feel better and tell you that when I cleaned under my couch the other day, I filled a whole laundry basket!! We’ve only had our couch for a couple of months. But it is a magnet for our daughter’s toys. And we found a cell phone that had been missing. lol. Ha,ha, a shriveled up carrot! That is hilarious. I am so proud of you for sharing that! 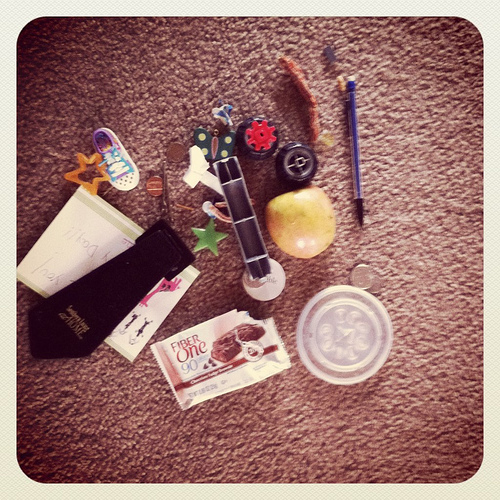 I’ve found things like it under my couch (and under the car seats in my car). A pity about those earrings, they are nice ones. That is always so sad. Good for you letting them go. I’m amazed you did any cleaning today with the webcast tonight. I would have had such a hard time focusing! That was the first thing I thought too when I read that! Instead of stopping that fun family ritual, I would just see this as a reminder that I need to clean under the couch more often than I thought! I think getting rid of mismatched earrings could keep me going for a while… I keep hoping the missing match will show up.. that and my box of mismatched kids socks!!! I wish that was all that I found under our couches. It was very humbling writing up a post for that assignment. I must say though I am glad it is done and am looking forward to tomorrows assignment. I caught a few minutes of your live webcast, it looked great! 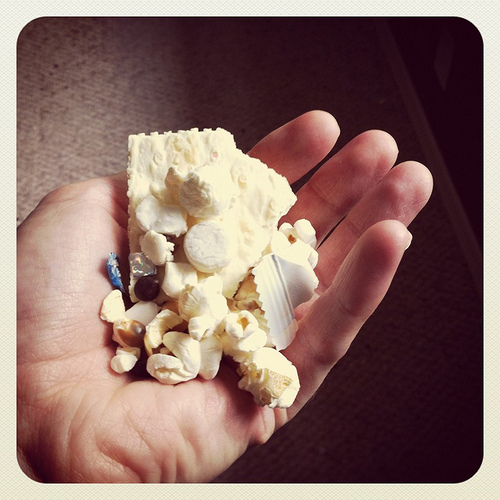 I cleaned under/behind the couch last week and found a ton of stuff, including popcorn. 🙂 After I cleaned the hardwood floor and put the couch back, I rolled up two play rugs (the kind to roll cars on) and put them right up under the couch. They are just out of sight, and they keep things from getting pushed under the couch. When I was a kid and Mom would make me eat things I didn’t like, I’d often find ways to stash them under the chair or couch. I never got caught but I’m sure she wondered about the food she found….. I turn my un-matched earrings into necklaces too. It affords me many necklace charms. I have say a huge thank you for showing us the real you. The person that has crumbs, messy bed, and everything else that goes wrong and does in a house of kids, business and homeshooling. Thank you for the real you. It is truly appreciated. 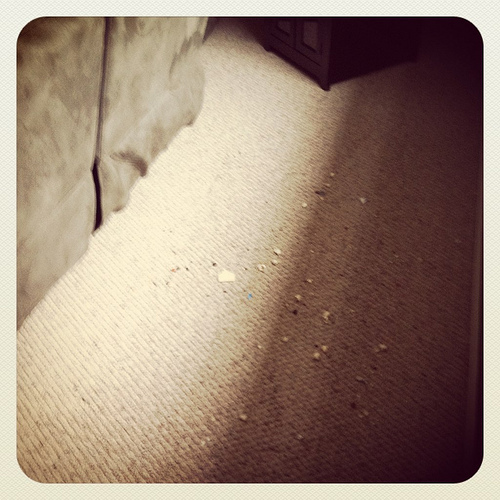 under my couch isn’t too bad – mostly dust bunnies… but under the couch CUSHIONS…yikes! No carrots, but plenty of other food and nonfood items. Thank you for doing this series. These are all projects I have needed to do but never mdee time for – until now. You did a great job with the webcast! My husband commented that he and Jesse both want to spend their blow money on the same things. Good job today, it’s amazing what we can find under our furniture! That’s funny about our husbands. 🙂 And thanks for your kind encouragement! 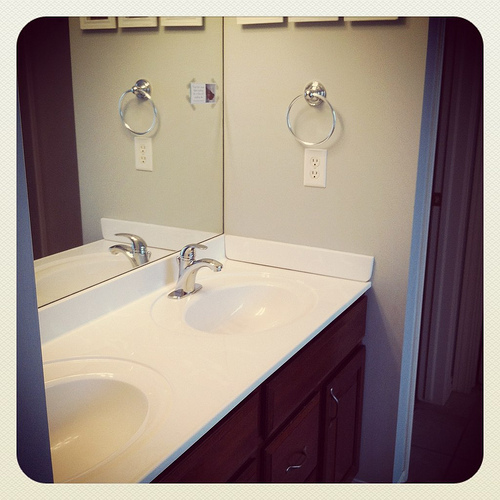 I got 2 out of 3 bathrooms done. While I was vacuuming, it started to smoke! Oh well, couldn’t finish that task, but will do it over the weekend. Picked out more than 7 items of my clothes to donate. Thanks for keeping it real. Your blog is SUCH an encouragement to me! 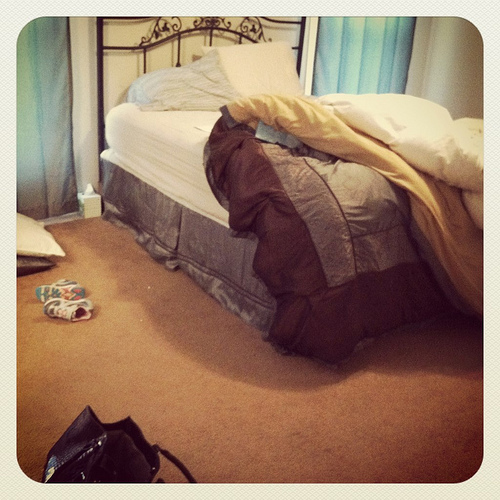 And I’m not usually observant, but did you move you bed around since your last post with pictures of your bedroom? Thanks again for everything! My couches are much, much worse – mounds of toys on a regular basis. i cleaned out my kids rooms this past weekend while they spent a couple nights at grandma’s….my son’s (5) was mostly toys (pulled out 3 diaper boxes full to donate)….my daughter’s (7) on the other hand was a full bag of trash….your small pile from under you furniture was NOTHING in comparison to what i pulled out from under her bed, desk, dresser, chest, and shelf. i was shocked that that much stuff could fit under those things!!! it was mostly papers and broken crayons and the occasional ponytail fastener but i found crackers and food wrappers too (they are not allowed to have food in their rooms so someone has been sneaking). i am loving these assignments, they come at the perfect time for me as i am due with baby #3 on mother’s day and am really wanting to get the house ready before he gets here!!! now if the motivation sticks i will be good to go!!!! One time when my piano tuner cam he found half a baked potato in my baby grand! In my defense I had just bought it from a friend who was moving and it seems it was one of her 5 boys who didn’t want to eat his dinner! Wow. If that amount of stuff is horrifying to you I think I will never share what I have found not only under our couch, but in our cushions as well. When we do our heavier cleaning on Mondays, it is my 13 year old son’s job to move all the living room furniture and vacuum underneath. It doesn’t take long since we do it weekly, and it never gets too bad! This is one of the best things I’ve implemented. I didn’t even bother with my couches. I can’t move them easily myself, and we’d done them recently. Yikes on the bath scrub! Glad she’s okay. The things kids find and eat .. LOL. So glad I’m not the only one with stuff under the couches. You make me feel so NORMAL!! Thank you! I am completely distracted by the photos of your bathroom. Why is there something taped to the wall in the reflection in the mirror, but not taped to the actual wall? It’s making my brain hurt! 🙂 I am really enjoying the series…and still trying to figure out that mirror, lol! It does! I have been ‘seeing’ it on the wall, and didn’t ‘see’ how it could be anywhere else (like on the mirror) until you said it. I think I had an optical block or something, LOL! It looks like it is just something taped to the mirror -probably an Scripture or an inspirational quote. Or if it is like my house-it may be something my kids taped to the mirror. Just yesterday I was cleaning out the van and found part of a grilled cheese sandwich under the passenger seat. I don’t remember the last time the kids had grilled cheese in the car. Talk about gross. This is really keeping me on track. Thank you so much for this challenge! You are always very encouraging and I love that you are honest about your messes too. Just wanted you to know I appreciate the “real” pictures that aren’t so perfect. Makes me feel like I may not be the only one whose house isn’t perfect all the time. I like posts that make me feel normal. 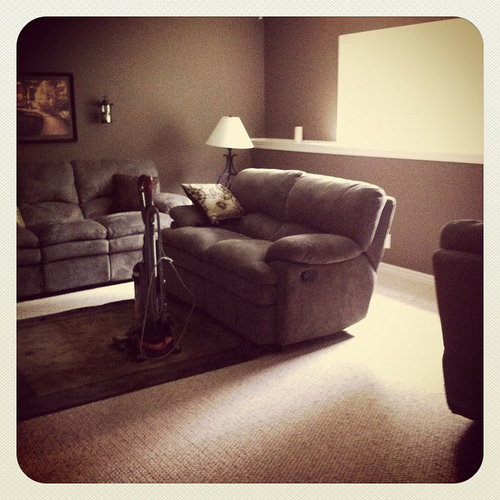 Thanks for the pictures Crystal, but I still feel like your house doesn’t look lived in (despite the couch findings). You work miracles with three kiddos! I have really random questions though. Where is the soap, towels in the bathroom? No nightstand/alarm clock, etc. in the bedroom? I love your minimalist approach and would love to know how you function with so little. I feel like all the little things are what contribute to the clutter at my house. Soap/towel are on the other side. We primarily just use one sink so I keep the things on that side. And our bedroom is pretty sparse. We are saving to buy a bedroom set and hope to do that soon. When we do, we’ll be getting a nightstand or two. WE FOUND JESUS – UNDER OUR COUCH! Our Fisher-Price baby Jesus from the Little People Nativity Set has been missing since the day we got it – yesterday, thanks to this assignment, we found Him. Just in tiem for Easter! My 2-year-old was thrilled! Last week I discovered a moldy tomato under the floor-length curtains in the dining room! Now that’s pretty gross! LOL. Thank you for posting the under the couch pics! I am horrified each time I clean under the couch and cushions and feel so inadequate that I can’t keep them clean! I am so glad to know I am NOT the only one!! I’m so glad you decided to post those pics!! The couch pictures made me feel a little better about finding a petrified strawberry under our couch, as well as plenty of misc snack crumbs (or chunks…lol). Day four done. I finished all the goals on my list for today I cleaned out under all the couches. found seven items to donate and clean the bathroom including the tub and the sink and the toilet. unfortunately I did not make it to the cabinets and clean those out like I wanted. Today is the last day of this week and when it comes to my five goals for this week I’ve done three of two.